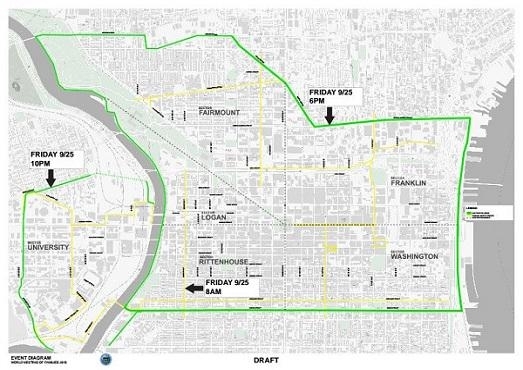 Philadelphia Mayor Michael Nutter and city officials announced major traffic plans and road closures today for the Papal visit in September. Pope Francis will be in town Saturday and Sunday, September 26th and 27th, and 1.5 million people are expected to be visiting for his appearances during the weekend. In order to ensure the safety of everyone they have set up a "traffic box" around Center City. It basically goes from South Street to Spring Garden/Ridge/Girard in the north and Delaware Ave across to 38th Street. It will go into effect at 6 pm Friday September 25th. Vehicles will not be permitted to enter into the box after that time, but they will be allowed to leave. Cars already inside the box will be able to travel within the box. PennDOT will be closing major highways. 76 eastbound from the Blue Route to 95, 76 westbound from 95 to Route 1, City Ave between Lancaster Ave and Belmont Ave, and 676 will be shut down starting on Friday September 25th at 10 pm. I-95, I-276, and I-476 will remain open. The Ben Franklin Bridge will be closed on Friday at 6 pm and not reopen until Monday at noon. Times for reopening the other closures were not announced. Investigators have found a body Wednesday while searching for a missing boy from Folcroft, Delaware County. 11-year-old Laquan "Quan" Lattimore has been missing since 3 p.m. on Monday. He was last seen riding his bike near King Avenue and Chester Pike. Police have not said if the body found is that of Lattimore. It was found in Darby Creek in Prospect Park. Lattimore is described as a black male, 5’3″ tall, 125 pounds with a light brown complexion. He was wearing a blue and white collared shirt, blue denim jeans, black sneakers and was carrying a grey backpack. The family is offering a $1,500 reward. If you have any information call 1-800-THE-LOST (800-843-5678), the tip-line number for the National Center for Missing & Exploited Children. A Middletown Township, Bucks County man has been charged for fatally stabbing his father with a sword. It happened around 5:30 p.m. on Tuesday on the 500 block of Trappe Lane in Langhorne. 26-year-old Eli Goodrich and his father 66-year-old Alan Goodrich got into an argument that resulted in the attack. The father was taken to St. Mary Medical Center where he died. Eli was taken into custody at the scene. He was arraigned on Criminal Homicide and relater charges. He is being held without bail at Bucks County Correctional Facility. 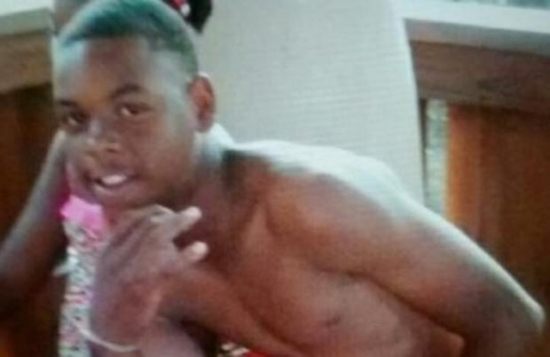 11-year-old Laquan "Quan" Lattimore has been missing since 3 p.m. on Monday.